Do you live in an apartment or condo? Do you compost? The usual response is “well, of course not!” Traditional composting is unlikely to be a viable option for most people living in apartments and condos. 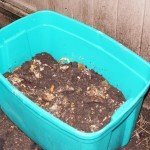 However, bokashi composting offers a great solution for people who want to create rich homemade compost in their condo, townhouse, apartment or any home where space may be restricting. What makes bokashi suitable for condos? Even though we have organics collection in our building, I wanted to make my own compost because I didn’t want to purchase bags of potting mix or compost every year. I grow mostly herbs and vegetables on the balcony. There aren’t many options for apartments. I wasn’t keen on having worms on my balcony so after some research I found out about the bokashi method. … I really like your bin, easy to open and close and practical to empty the ‘tea’ which i’ve been using on my plants. The bokashi indoor composter is small and fits easily into most kitchens or balconies. With the bokashi composting process there is no need for a large outdoor composter. The food waste is transformed into compost in just 4-6 weeks, meaning that you only need space to store 2 bins. Bokashi compost and the compost tea are both teeming with healthy microbes that are essential for producing healthy, productive soils. Bokashi compost and bokashi compost tea are fantastic when added to container gardens; a common sight on many condo balconies. The microbes and nutrients provided by the bokashi compost and tea are especially valuable if you are growing your own fruits and vegetables in containers. Growing food in containers can quickly draw nutrients and minerals from your soil. The bokashi pre-compost and compost tea allows you to replace these and reinvigorate your soil so that you can maximize your yields. We all need to be considerate of our neighbors and local community but this is especially true in higher density housing such as condo-living. The bokashi composting process is completed in a sealed bin meaning that there are no foul odors or pests that can be associated with traditional composting. Bokashi compost is fantastic for your soil and your container plants will love the additional nutrients and healthy bacteria. Use the bokashi composter as often or as little as you need. For example, you might want to use the bokashi composter over the winter months to refill your containers with compost ready for the spring and the following growing season. If you are rotating crops in your containers over the summer then you might want to fill a couple of bokashi bins to coincide with times when you can bury the pre-compost after you have removed a crop. 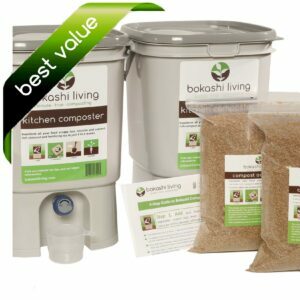 Alternatively, you may want to use bokashi throughout the year so that you can use the bokashi compost tea to fertilize your plants. Any unused bokashi pre-compost can be put into your organics bin (if these are collected in your condo) or read on to find more ideas for your pre-compost. A soil factory is a simple way of converting your pre-compost to usable compost that can be applied directly to your plants and containers. 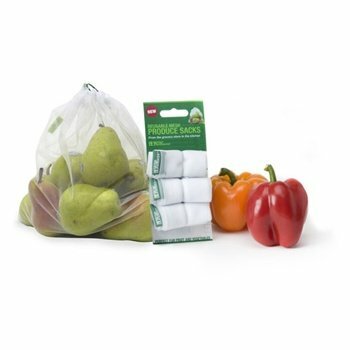 This is a great way to store and process your bokashi pre-compost at times when you are not able to add it directly to your containers. How to make a simple soil factory. Bokashi pre-compost is a valuable source of nutrients and microbes for anyone’s garden. Do you have any green-thumbed friends or family members? If so, why not donate your fermented bokashi bin to them. That way you can use the amazing bokashi tea on your own plants and maybe you can get some of your friend’s/family’s abundant homegrown harvest in return for your great pre-compost! If you don’t have a local friend or family member who can take advantage of your supply of pre-compost; how about connecting with a local community or school garden. Once again, they should be more than happy to take some (or all!) of your fermented food waste. Remember that the pre-compost is a great addition to existing compost piles. The microbes in the bokashi pre-compost help to re-invigorate slow or failing compost heaps. Remember, your bin full of fermented food waste is no longer waste. It is now a very valuable resource for gardeners, farmers and landscapers. Get out into your community to connect with people who may benefit from your pre-compost.